Peer review is a system used to decide if an article should be published in a peer-reviewed journal. Each paper submitted to a peer-reviewed journal is read and evaluated by experts in the article’s subject area. The reviewers assess the article’s validity, importance, and originality, and then recommend whether it should be printed in the journal. 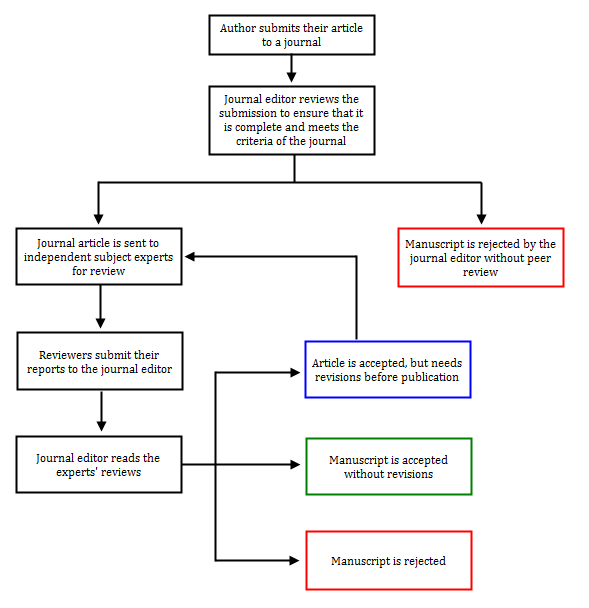 The reviewers’ suggestions are considered by the journal’s editor, who makes the final decision about whether to accept or reject the article. Peer review ensures that quality papers are published in the journal. The reviewers confirm that articles do not contain technical problems, ethical issues or significant errors. They also verify that the authors used the appropriate study methodology, analyzed and interpreted the results correctly, and provided enough evidence to support their conclusions. Since peer review filters out work that is poorly done and makes sure that the manuscript is accurate, publication in a peer reviewed journal shows that the article is trustworthy. Read the journal’s "About us" section on their website to see if the words "peer-reviewed" or "refereed" are used. Also look for editorial statements (such as "articles are evaluated by two to three subject experts") or author instructions (for example, "please submit three copies of the manuscript so that they can be mailed to reviewers"). Ulrich's International Periodicals Directory is a database that contains detailed information about journals and magazines published around the world. To find out if a journal is peer reviewed, type the full name of the journal into the search box, and then click the green search button. 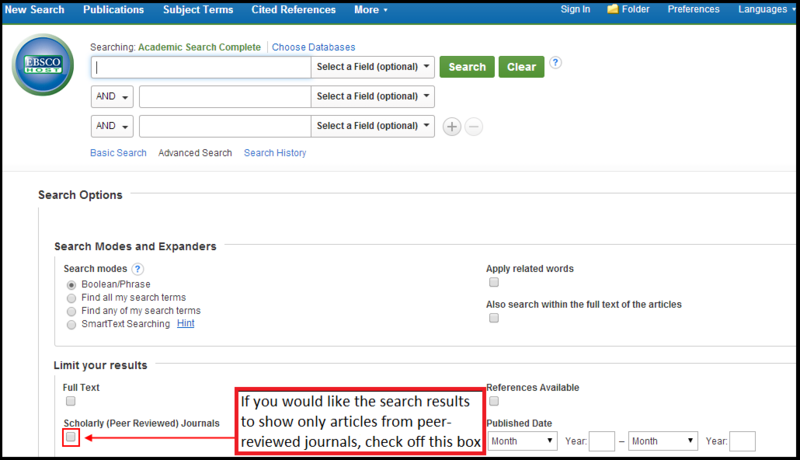 On the search results page, find the entry for the journal you are researching. Check to see if there is an icon of a referee’s jersey to the left of the journal title. 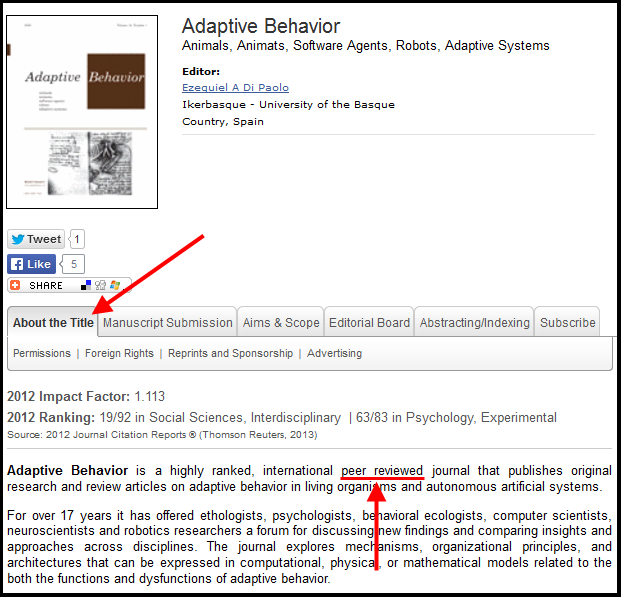 The icon indicates that the journal is peer reviewed. You can also click on the journal's title to see more information. This will take you to the journal's complete record. If the journal is peer reviewed, it will say "yes" in the row labelled "refereed."